At Indian Orchards in Media, PA, orchard care is a family affair. The Bernhardt family, now in their fourth generation, manage the 104-year-old, 36-acre organic property which offers diverse picked, and you-pick plantings of blackberries, raspberries, apples, plums, apricots, peaches, and more, along with seasonal offerings like cider, jams, hollies, and Christmas trees. The property, tucked off of Rt. 352 in Delaware County just 30 minutes from Philadelphia, is a vestige to carefully tended farm traditions that evolve over time, like a cherished recipe, or rows of decades-old burled trees overlooking newly planted ones, yet still to set out fruit. 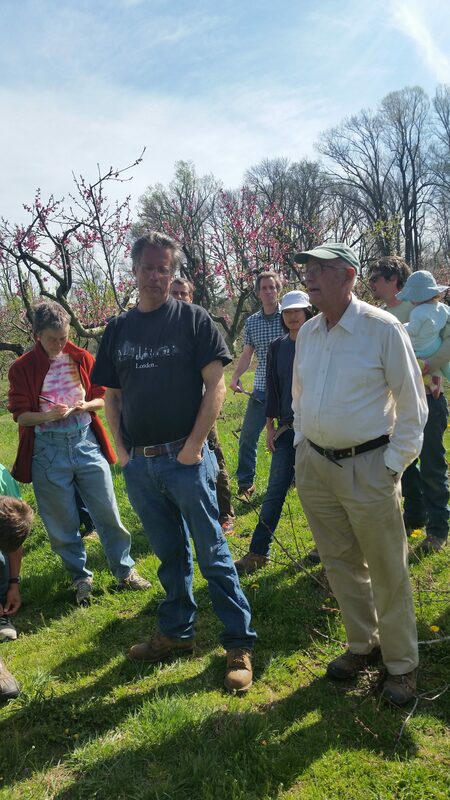 POP orchardists toured the site as part of Pennsylvania Association for Sustainable Agriculture’s (PASA) springtime series to learn about Indian Orchards’ unique history, preservation, and care practices. The property dates back as early as 1794 with the historic barn-house from that time still standing. During the Japanese American War in the early 1940s, the property became a refuge and a place to establish livelihood for formerly interned Japanese, who worked picking fruit in the orchard. 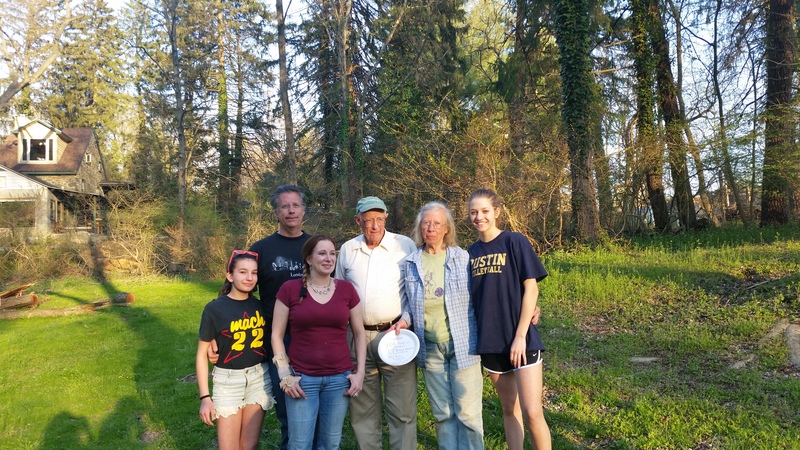 In 1981, the property became officially protected as a historic property with the Middle Township Land Conservancy. 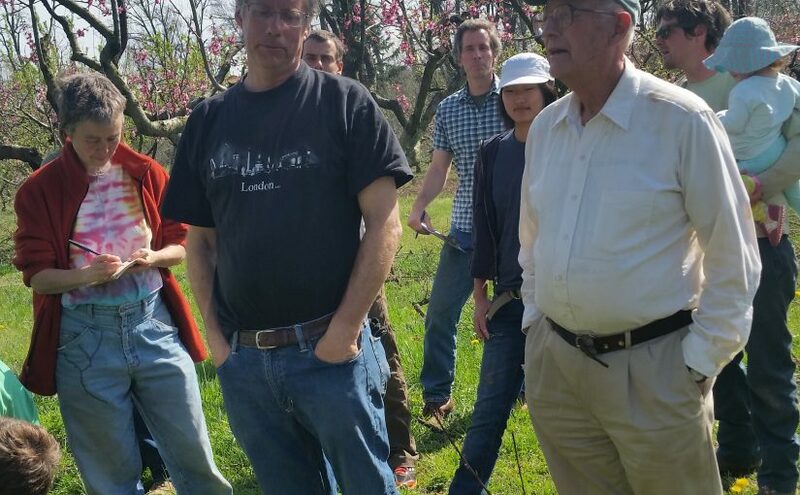 Current caretaker Ben Bernhardt, and parents Nancy and Bob led the group through the site’s winding terraces and shared anecdotes about their favorite fruit varietals and what they’ve learned over the years. 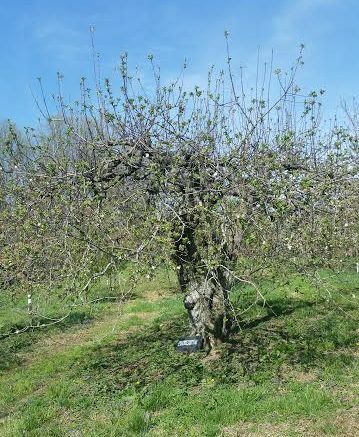 Even with a productive orchard as theirs, which leaves little remaining fruit for cider-making (they produce a humble 70 gallons a year) the orchard has only ever been managed part-time. 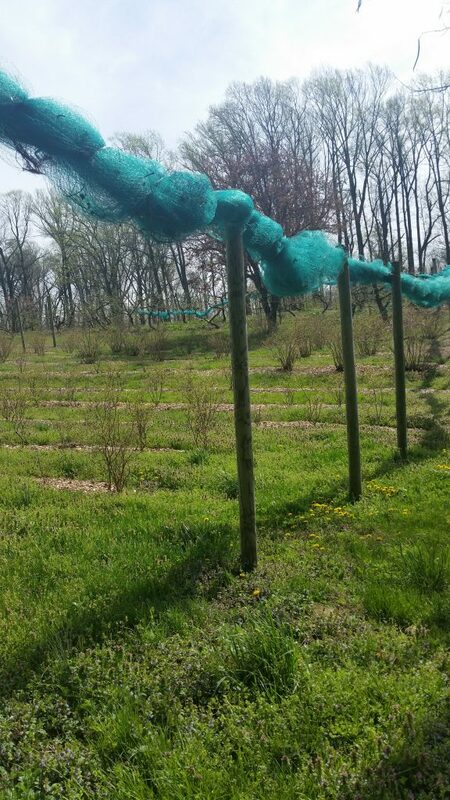 The plantings are hand-tended and pruned, and on occasion, hand-sprayed with organic pest and disease controls against some of their most common pests and diseases like Japanese beetle, bagworm, fire blight, milky spore, scale, and brown rot. Fruit tree ultimatums are not common practice, however. Rather, the caretakers seem to hold a deep reverence toward their plantings with a flexibility that involves a great deal of interplanting and experimentation with varieties. The blueberry crops fruit from June through August, variety dependent, and are maintained with minimal seasonal pruning, and the addition of four inches of peat mulch each year to maintain the shrub’s acid-loving soil conditions. 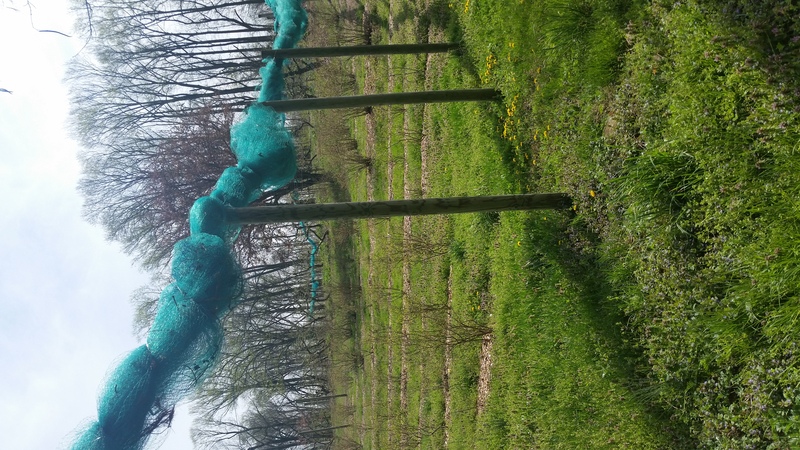 Because blueberries are well loved by birds, too, the family uses smartnet strung between hardwood posts to protect their crop. Apples are equally as diverse in variety, age, and interplanting with top varieties being ‘Baldwin,’ ‘Enterprise,’ ‘Freedom,’ and ‘Rome,’ grafted upon M26 Geneva rootstock from 1976. 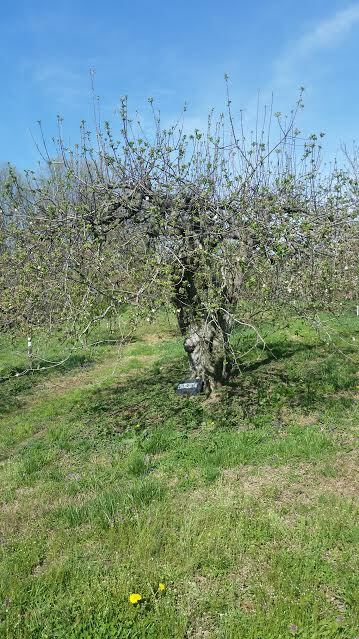 The ‘Smokehouse’ variety with showy end-branch blossoming, is a historic Pennsylvania variety from 1837 that got its name from William Gibbons, who noticed the original tree growing beside his smokehouse. The tree produces a great cooking apple with firm flesh and skin green to red in color. It requires extra care, the Bernhardts said, to not prune away the fruit-producing spurs prematurely. As for peaches, ‘White Lady,’ ‘Blushing Star,’ ‘John Boy,’ and ‘Flamin’ Fury’ reign supreme. ‘White Lady’ produces low acid fruit with a light red blush, that is well adapted to fluctuating spring conditions. ‘Flamin’ Fury’ varieties out of Michigan are popular for their resilience and long-growing period of 15 weeks. ‘John Boy’ produce large, firm fruits that are growing in popularity commercially for their resistance to bacterial spot. In addition to their popular you-pick fruits, Indian Orchards also grows less known fruits like quinces, persimmons, Asian pears, and medlars, a winter fruit grown since Roman times that requires ‘bletting’ a process of controlled rotting to prime the fruit into delectable sweetness. For those intrigued by historical brewing practices, the grounds are also home to a variety of the 300-year old spruce Benjamin Franklin was said to have used as a flavoring agent in his legendary beer, which has experienced a revival with contemporary brewers such as Yards’ Poor Richard Tavern Spruce. To experience and support the delicious history of the ever-expanding Indian Orchards and its you-pick and farm-stand offerings, visit their website at http://indianorchardsfarm.com. For the first time in 2017, Indian Orchards is also offering Fruit Plus CSA shares featuring weekly boxes of fruit and more. This POP Orchard Spotlight prepared by Education Director Alyssa Schimmel.